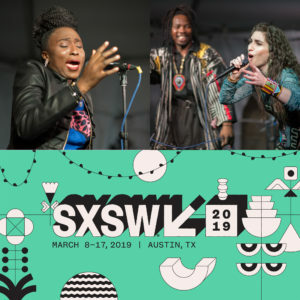 In 2019, for the first time, Afropop Worldwide hosted a stage at South by Southwest in Austin, Texas. Our lineup features innovative new sounds out of Africa, including Jojo Abot from Ghana, Adekunle Gold and Aramide from Nigeria, groundbreaking deejay AfrotroniX, Nsimbi from Uganda. We’ll meet the artists, sample their sets, and take in the growing presence of African music at America’s most essential pop music expo. Produced by Banning Eyre. GEORGES: THESE ARE HAPPY REVELERS! 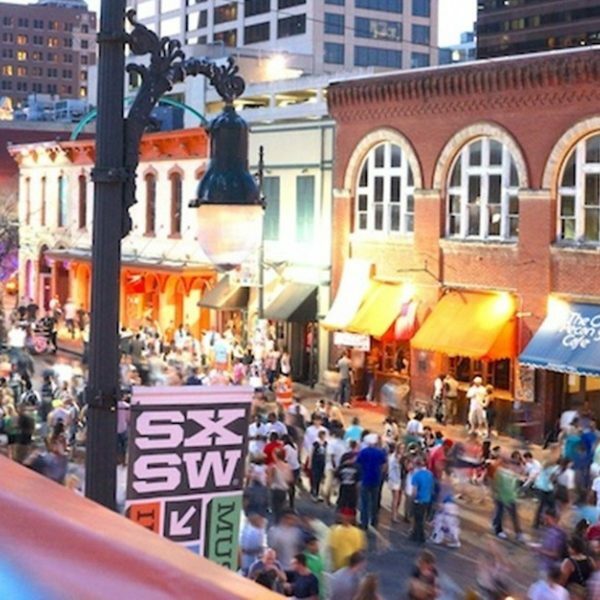 WE ARE ON SIXTH STREET IN AUSTIN, TEXAS, THE BUSTLING HEART OF AUSTIN’S SIGNATURE SPRING EXTRAVAGANZA, SOUTH BY SOUTHWEST. THE EVENT BEGAN IN 1987 AS A MUSIC FESTIVAL, BUT IT HAS GROWN TO INCLUDE FILM, TECHNOLOGY, SOCIAL POLICY, GAMING AND OF COURSE, MUSIC, INCLUDING…AFRICAN MUSIC. HELLO, GEORGES COLLINET WITH YOU ON AFROPOP WORLDWIDE FROM PRI PUBLIC RADIO INTERNATIONAL. I AM PLEASED TO REPORT THAT IN 2019, FOR THE VERY FIRST TIME, AFROPOP WORLDWIDE HOSTED A SOUTH BY SOUTHWEST SHOWCASE AT THE PALM DOOR ON SIXTH STREET. AND I TELL YOU, IT WAS AN ELECTRIFYING NIGHT--SIX ACTS IN SIX HOURS, REPRESENTING THE FAR CORNERS OF AFRICA. STARTING WITH THE BAND NSIMBI, LED BY G.N.L. ZAMBA FROM UGANDA. GEORGES: AH, THE GENTLE EAST AFRICAN VIBE OF NSIMBI, EASING INTO A LONG NIGHT OF MUSIC AT AFROPOP’S SOUTH BY SOUTHWEST SHOWCASE. NSIMBI’S FOUNDERS ARE GNL ZAMBA, A HIP-HOP ARTIST AND STORY TELLER FROM KAMPALA, AND AMERICAN SINGER-SONGWRITER, MIRIAM TAMAR. MIRIAM WORKED IN UGANDA FOR FIVE YEARS, FIRST FOR AN N.G.O., THEN IN THE MUSIC INDUSTRY AND ULTIMATELY AS ZAMBA’S PARTNER IN NSIMBI. THEY HAVE A FAB DEBUT ALBUM PRODUCED WITH UGANDAN AND CONGOLESE COLLABORATORS IN WASHINGTON, DC. WE’LL HEAR SOME OF THAT ALBUM, BUT FIRST, LET’S INTRODUCE THE MUSICIANS THEY BROUGHT TO AUSTIN. HERE’S MIRIAM. ACTY: 02_Miriam_band.wav We’re excited tonight to be playing with Nadal Peled, who is a very talented guitarist. He's Israeli and plays with his own Ethiopian jazz band. And we also have Joseck Asekoye from Kenya whose a fabulous musician as well, and he also has his own Kenyan band. ACTY: 03_GNL_band.wav We have been blending so well together because they also understand the language of the music and the rhythms, Bantu-Nilotic rhythms, which are mainly embodied in the Nsimbi album and Nsimbi music. ACTY: 04_GNL_Mujje.wav “Mujje” basically means, "Come together." It's the phrase that they used to call people to the fireplace. Mujje. So people begin on drumming. “Gwanga, mujje, gwanga, mujje.” Meaning "The nation, come. The nation, come." So people, whatever they are doing, just go have a meal around the fireplace, and they begin communing and making music and dancing. So in that very traditional, Afropop Worldwide is going to be our fireplace tonight. ACTY: 05_GNL_Nsimbi.wav Nsimbi is a very, very old name from the lake people. My tribe is the Baganda, which are like the lake people. Nsimbi means something that is of the sea and also of the earth, the land So if you know what the puka shell is, like a cowry shell, this is what nsimbi is. It is around… they call it Lake Victoria, but the natives call it Naluvale. So this is the nsimbi, and it is the original seed, which also happens to be my name from my great great grandfather, And since our music is about ancient wisdom informing the present, we thought Nsimbi was perfect. ACTY: 06_Nsimbi_cowry.wav (Stereo) M: Yes, we also loved when we were reading about the cowry shell, that is found in all continents. GNL: Yes, you go to China, you find the cowry shell, you go to the native America you find cowry shell, you go to South America you find the cowry shell. So in all these ancient communities, you can find a connecting thread for all peoples. GEORGES: WE’RE HEARING “MUJJE” FROM NSIMBI’S DEBUT ALBUM, PRODUCED WITH KINOBE (CHI-NOH-BEH) FROM UGANDA AND JAJA BASHENGEZI FROM CONGO. ACTY: 07_GNL_album.wav I feel all that I have recorded before this is the one most connected to it is of my ancestry, and our beliefs, and what we would like to pass on to the world. I believe that Nsimbi is the complete piece of music. ACTY: 08_Miriam_tradition.wav Unfortunately, a lot of Ugandan traditional sounds have been lost. It's not as rich of a tradition currently as some of the West African countries. GEORGES: SAD BUT TRUE. STILL, UGANDAN ARTIST LIKE ZANGA AND KINOBE ARE DOING ALL THEY CAN TO CHANGE THAT. ZANGA TOLD US ONE WAY PROMOTING TRADITION IS THROUGH LANGUAGE, IN HIS CASE, RAPPING. LET’S HEAD BACK TO OUR SHOWCASE AT THE PALM DOOR. ACTY: 09_GNL_Luganda.wav When I began rapping in Luganda, people understood the poetry and the deeper meaning more. And eventually, when we decided to create an album, I chose the riddles, like the old riddles that my great grandmother used to say, or my aunties. Basically, everybody's lullaby, everybody's riddle. And I began discovering more about the language. And I met Kinobe at the National Theater, because I began going over there. Instead of using Western-style beats, we began rapping to drums. ACTY: 11_Aramide_intro.wav My name is Aramide. I’m a singer, songwriter, guitarist from Nigeria and I’m here at SXSW showcasing at the Palm Door tonight. Come out. You might listen to some beautiful Afro-Soul music. GEORGES: WOW, WHAT A SOULFUL VOICE. NIGERIA’S ARAMIDE. ARAMIDE GREW UP IN JOS, PLATO STATE, NORTHERN NIGERIAN CITY. SHE STARTED WRITING SONGS WHEN SHE WAS A TEENAGER. ACTY: 12_Aramide_start.wav Music is my companion, because I come from a very small family. I have brothers, and then I was the only girl, so they didn't used to play with me, so somehow music became the go to thing. My father used to listen to very good music, lots of Afrobeat, Fela, Kool and the Gang, Aretha Franklin, Ray Charles, and lots of very beautiful African soul and jazz music. So somehow I just kind of picked the sound and created mine. GEORGES: ARAMIDE TOOK UP A GUITAR WHEN SHE BEGAN TO WRITE SONGS. SHE ADMIRED WOMEN WHO SANG AND PLAYED AN INSTRUMENT LIKE INDIE ARIE, ALICIA KEYES, AND NIGERIA’S OWN ASA. AND SHE MADE A PLACE FOR HERSELF IN NIGERIA’S COMPETITIVE MUSIC INDUSTRY. ACTY: 13_Aramide_AfroSoul.wav My music is very soulful. I call it Afro Soul. And the music and Legos, Afrobeats is very fast. It comes and goes, you know. But since I got in, the initial challenge I had was people didn't understand the style of music, the genre, like what I was trying to do. It was a bit slow, but over time, more artists started to come in. People like Asa opened the door for someone like me. There's room for variety now. GEORGES: ARAMIDE COULDN’T BRING HER BAND FROM LAGOS, BUT SHE FOUND SOME TEXANS WHO PERFORM HER MUSIC BEAUTIFULLY. ACTY: 14_Aramide_band.wav The band is coming from Houston. I’ve played with them before. They are not Nigerians, but they are musicians and they understand the music. Because, you know, we were all exposed to different kinds of music. But somehow, we were able to find a middle ground and we are going to do an amazing show. GEORGES: ARAMIDE AND HER TEXAS POSSE PERFORMING THE SONG “BOSE” FROM HER ALBUM SUITCASE. ARAMIDE IS PART OF A NEW GENERATION OF FEMALE ARTISTS IN NIGERIA. SHE SAYS THAT IN THE PAST, PRODUCERS TENDED TO THINK THAT A FEMALE SINGER WOULD STOP AFTER A FEW YEARS TO MARRY AND HAVE KIDS, SO WHY INVEST IN HER CAREER? ARAMIDE BEGS TO DIFFER. ACTY: 15_Aramide_woman.wav Female artists are super hard-working. You see them learning their routines, doing choreography, singing and dancing at the same time. I’m not saying that the guys don't do that, but we’re putting in so much effort, and people have seen now that it's a lot of hard work, and nobody wants you to look at them and say, "You're not going to last. You’re not going to pass. After two years you’re going to get tired." No. You sign a woman it's really expensive. There's a lot goes into it. There's hair that there's makeup. Our industry and Nigeria is not very structured yet. A lot of people were still learning how to put a woman on a platform. How do you promote her? 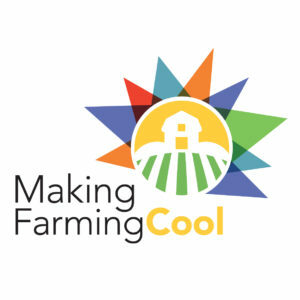 How do you make sure that this career is sustainable? How do you make sure this thing moves forward. Women are more confident because now there are some examples, people who have done it like Tiwa Savage, Maome. We have people that have actually done these things. Yemi Alade. They are touring. They are topping charts. They're living the same thing with the guys. GEORGES: ARAMIDE, KICKING IT OUT AT THE AFROPOP WORLDWIDE SHOWCASE AT SOUTH BY SOUTHWEST. YOU’LL BE SEEING MORE OF HER. COUNT ON IT! NEXT UP, AN ARTIST FROM BENIN WITH A STORY AND A MISSION. SHIRAZEE! GEORGES: EVEN WITH A RASPY VOICE, SHIRAZEE HAD HIS CROWD ROCKING. WE’LL HEAR HIM IN FULL VOICE IN A MOMENT FROM HIS EP HOME AND AWAY. BUT FIRST, SHIRAZEE HAS AN UNUSUAL STORY, BEGININNING WITH A TOUGH-MINDED SINGLE MOTHER IN BENIN. ACTY: 16_Shirazee_kid.wav I give all credits to my mother. I was raised by a strong queen who put no limits into how far you can dream. I would wake up and she would be listening to a different kind of music, She would be listening to Otis Redding one day. Then she would be listening to African artists like Stan Tahal Samba Hontenialou, Gnonas Pedro, and then Michael Jackson another day. And then she would be listening to The Eagles. We would only get the singles. Only the best songs made it to us in Benin when I was a kid, right? And so my ears were already tuned into hearing the hit melodies, without knowing it. GEORGES: AT AGE 11, SHIRAZEE WAS SENT TO BOARDING SCHOOL IN GHANA, WHERE HE DISCOVERED HIGHLIFE AND RAP. THEN THE FAMILY MOVED TO SOUTH AFRICA, WHERE, STILL A SCHOOLBOY, HE BEGAN WRITING JINGLES FOR DJ FRESH AND OTHERS. WHEN HIS MOTHER RETURNED TO HER RESTAURANT BUSINESS IN BENIN, SHIRAZEE HEADED FOR PARIS, LOOKING FOR SOMETHING BIGGER, SOMETHING HE WOULD EVENTUALLY FIND IN AMERICA. ACTY: 17_Shirazee_mother.wav For a few years she was upset. She didn’t talk to me. It was hard because her son was in America, but my dreams were bigger than being limited. That’s no disrespect to what she’s doing. I love what she’s up to, but I also want to change her life. I don’t want her working at her age in a restaurant. GEORGES: SHIRAZEE HAD A SERIES OF GOOD BREAKS THAT TOOK HIM FIRST TO ATLANTA, THEN DETROIT, AND THEN NEW YORK WHERE HE WAS SIGNED TO EMI AND WORKED WITH LEGENDS FROM STING TO USHER TO AKON. ISLAND RECORDS ALSO SIGNED HIM FOR THIS SONG, “DIFFERENT.” A TERRIFIC YOUTUBE VIDEO BY THE WAY. GEORGES: FOR ALL THIS SUCCESS, SHIRAZEE FELT THAT SOMETHING WAS MISSING. ACTY: 18_Shirazee_wave.wav I needed to express the Afro side of me. And what “Different” did was, it was so pop, it was not allowing me to express the other side, and I knew this was coming. I knew this wave was coming, this whole wave that we’re on right now, the Afropop wave, the Afrobeats wave, whatever you want to call it. I’m listening to everything. I know the number one songs right now in Nigeria. When a song comes out, I have my ears, like this, to the street. GEORGES: WE MET SHIRAZEE THE DAY AFTER OUR SHOWCASE, AND DESPITE HIS HOARSE VOICE, HE WAS PUMPED ABOUT THE EXPERIENCE, ESPECIALLY THE DIVERSITY OF THE CROWD. ACTY: 19_Shirazee_community.wav At the show yesterday, I had Japanese people come up to me, Spanish people come up to me, asking for pictures. And that for me is why we make the music we make. We’re trying to touch the world because Benin is still unknown on the map. My mission, by the time I’m done, is for the whole wide world know Benin. You know, one of the best things that happened was a kid called Bryce. He quoted one of my raps from my first rap song. This guy was there as a proud Beninois, coming to support his brother. That is what I live for: Community, community. ACTY: 20_Shirazee_SXSW.wav This is my first time coming to SXSW, and this was some of the best experience I’ve had on stage in a long time. Because although my voice was gone, and I had to push through, the peoples’ energy got me through. And also because I got to meet different artists that we all respect from afar. Like Adekunle Gold was there, in the crowd. I spot him while I’m performing and I point at him. I’m like, “I see you.” He films, puts me on his social media, supports me. After my performance yesterday, we linked up. You know, that’s just one experience. But I’m not just saying this because you’re here, but yesterday was my best show. ACTY: 21_Shirazee_ID.wav Hi, my name is Shirazee and you’re listening to Afropop Worldwide. Stay tuned. Make Wilde with me. Soweto with me. Fifa with me. On Home and Away EP. I want you to go check it out right now. Rock with me. Follow me on all social media. And make sure you follow Afropop Worldwide as well. Shi Shi. GEORGES: THANK YOU, SHIRAZEE. 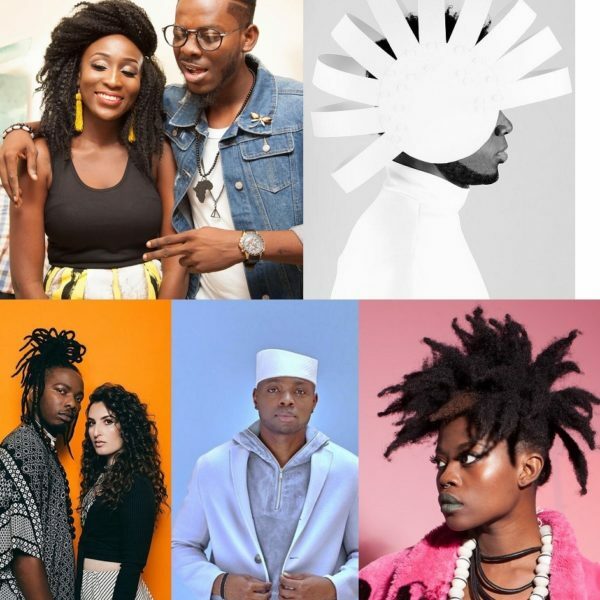 COMING UP, AFROTRONIX, JOJO ABOT, AND ADEKUNLE GOLD LIVE AT THE AFROPOP SHOWCASE AT SOUTH BY SOUTHWEST. AND VISIT AFROPOP.ORG TO SEE BANNING EYRE’S PHOTOGRAPHS FROM THE FESTIVAL. I’M GEORGES COLLINET, AND YOU’RE LISTENING TO AFROPOP WORLDWIDE, FROM PRI, PUBLIC RADIO INTERNATIONAL. GEORGES: TWO OF THE ARTISTS WHO PERFORMED AT THE AFROPOP SHOWCASE CALL THEMSELVES EXEMPLARS OF AFROFUTURISM. FIRST, FROM CHAD, BY WAY OF MONTREAL, AFROTRONIX. HE TOOK THE STAGE DRESSED IN WHITE AND WEARING A WHITE HELMET REMINISCENT OF THE MONSTER’S HEAD IN THE ALIEN FILMS. AT HIS SIDE, HIS PERCUSSIONIST/DEEJAY WEARING A TURBAN AND ROBE. THESE TWO CONJURED A MESMERIZING ELECTRO-SAHARAN GROOVE, AND AFTER A WHILE, AFROTRONIX PICKED UP A WHITE STRATOCASTER GUITAR AND WAILED LIKE A TUAREG ROCKER. ACTY: 22_AfrotroniX_intro.wav So I am Afrotronix from Chad. I was eight when I started early, singing with my brothers in church, because my father is a pastor, a pastor in a Muslim country. We had a band called Aitsow and moved it to Montréal in 2002. We came in to Montréal for music competition. We were finalists and that's how we ended up in Montréal. GEORGES: FAR FROM HOME, AFROTRONIX WAS FREE TO EXPERIMENT AND BEGAN MIXING CHADIAN ROOTS WITH JAZZ, ROCK, GOSPEL, AND EVENTUALLY, ELECTRONICA. ACTY: 23_AfrotroniX_different.wav I wanted to to get lost a little bit, do something completely different, get out of my comfort zone. Should show a different face, this new face of Africa. So I choose to talk about this Afro futurism, which is the main theme. It's from the tribal African music, fusion with electronic, but I'm not doing it the way some people are doing it. I go from African rhythms, so the electronic is serving the African music, but not the opposite. ACTY: 24_AfrotroniX_geography.wav In Chad, the geographic situation is great, because it represents the best of the whole of Africa. So on the north you have the Arabic influence, oriental rhythms and melodies, and in the South is the Bantu culture, and all this is mixed. And I grew up in Jemena, which is in the center of Chad. ACTY: 25_AfrotroniX_electro.wav It’s electro, so I have a DJ set. I mix with a percussion player, which is one of the best in Montreal, actually. Congolese tambour that mix with the Chadian rhythms. It’s going to be Sahara blues electro music. You will have a chance to hear my grandmothers’ voice in samples. I’m trying to bring Chad onstage tonight. GEORGES: AFROTRONIX LIVE AT SOUTH BY SOUTHWEST. AFROTONIX TOLD US HE GOT A LOT OF TRADITIONAL WISDOM AND INSPIRATION FROM HIS GRANDFATHER. GROWING UP IN A CHRISTIAN HOUSEHOLD IN A MUSLIM COUNTRY, IT’S INTERESTING THAT THIS YOUNG ARTIST ULTIMATELY FOUND HIS WAY BACK TO ANCIENT AFRICAN SPIRITUALITY. ACTY: 27_AfrotroniX_spirituality.wav My father was a pastor, he gave us some Christina values. And he expected me to be a pastor, to replace him, so I grew up a lot of Bible values. And my grandfather on the side tried to teach me, but with a little voice, because he's not allowed to teach me about African spirituality. In growing up, I ended up relating more to this spirituality, which is you are not allowed to talk on behalf of God. God talks to each person according to his needs, and we feel God through the energy that you feel from a tree, from the water, from the sun. This is how you feel God. GEORGES: AMEN TO THAT. IT SEEMED LIKE SOME OF THE TRANCE DANCERS AT THE PALM DOOR MIGHT HAVE BEEN FEELING GOD AS WELL. 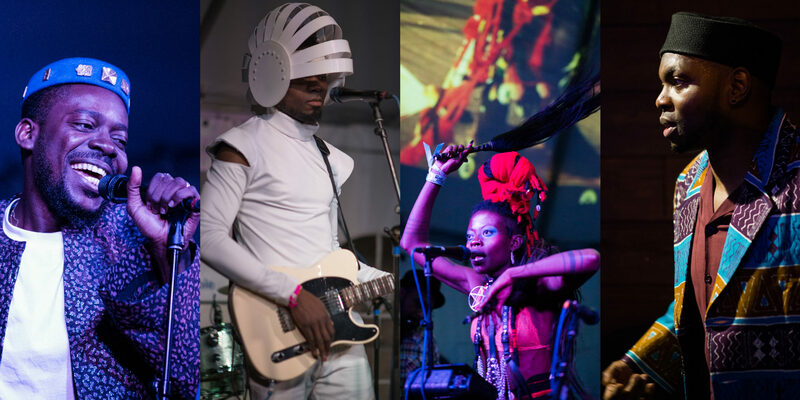 AS FOR AFROTRONIX, IT WAS HIS FIRST EXPERIENCE OF SOUTH BY SOUTHWEST, AND WE ASKED HIM HOW HE WAS FINDING IT. ACTY: 28_AfrotroniX_SXSW.wav Very good. Man but you see so many things going on at the same time. I meet nice people and the reactions were good. I’m a sort of Chadian ambassador in the culture because we don’t have Youssou N’Dour and Salif Keita. We’ve known 30 years of war, so the culture is something that is used in certain circumstances but we don’t have superstars. I’m the first one doing this, so I expect people to come and discover Chadian culture. GEORGES: KEEP AN EYE OUT FOR AFROTRONIX, A FASCINATING AND UNIQUE ARTIST ON THE RISE. THE SECOND ARTIST WE MIGHT CLASSIFY AS AFROFUTURISTIC IS OUR FRIEND JOJO ABOT FROM GHANA. WELL, YES, FROM GHANA. BUT HER MUSIC SEEMS TO FLOW FROM ANOTHER UNIVERSE ALTOGETHER. GEORGES: JOJO ABOT PERFORMING A SONG FROM HER UPCOMING EP. MAN, YOU HAVE TO SEE THIS WOMAN ON STAGE. HER COSTUMERY, MAKEUP, MOVES AND FACIAL EXPRESSIONS ARE ABSOLUTELY RIVETING. SUCH A PRESENCE. PROOF? WHILE YOU LISTEN TO THIS NEW SONG, “BAD MIND,” CHECK OUT THE PHOTOS OF JOJO ON AFROPOP.ORG. YOU’LL GET THE IDEA. GEORGES: THE INIMITABLE JOJO ABOT. WELL, DESPITE LOSING HER VOICE, SHE SURE ROCKED SOUTH BY SOUTHWEST, NOT ONCE, BUT THREE TIMES ON THREE DIFFERENT STAGES. WHEN IT WAS ALL OVER, WE MET HER AT ANOTHER SHOWCASE AND ASKED HOW SHE FELT ABOUT HER FIRST EXPERIENCE AT THE FESTIVAL. ACTY: 31_AGold_gold.wav So my name is Adekunle Kosoko. But then I was just in a sermon. Preacher kept saying, now you cannot substitute brass for gold. Said it like three times. I just took a cue. Maybe that’s my name right there, maybe gold. Adekunle Gold. And I just tried it out and people loved it. Okay, maybe that’s my name then. GEORGES: BUT ADEKUNLE’S MUSICAL EDUCATION BEGAN MUCH EARLIER THAN THAT. ACTY: 32_AGold_father.wav I’ll have to say thank you to my father for always playing King Sunny Ade, Ebeneezer Obey, Depo Sheripo, those legends from Nigeria, even though I didn’t want to hear them. Yeah, but he kept playing them all the time. He played them every morning and I kind of started to love them. Then I joined choir in church and I started to learn how to sing in different harmonies: alto, tenor, baritone. GEORGES: NOW, AS YOU MAY KNOW, MANY NIGERIAN POP MUSICIANS GOT THEIR START SINGING IN CHURCH, BUT ADEKUNLE’S CASE WAS A BIT DIFFERENT. ACTY: 33_AGold_religion.wav My background is a Muslim background. My dad is a Muslim, my mom is a Muslim. But my dad allowed us to go to church because my dad is a liberal person. My dad is a educationist. His idea of religion is there’s something to learn from all religions, so he allowed us to go to church and then it influenced the kind of person I am today. Because having learned the Koran, having learned the Bible as well, I kind of understand life a lot more, you know? It definitely shaped me. GEORGES: IN 2014, ADEKUNLE GOLD WAS SIGNED BY OLAMIDE, ONE OF NIGERIA’S TOP PRODUCERS. HE BECAME A BREAK-OUT HIT RIGHT OUT OF THE GATE. BUT HE TOLD US THE DAY AFTER OUR SHOWCASE THAT HE’S ALWAYS STRUGGLED TO DESCRIBE HIS SOUND. ACTY: 34_AGold_style.wav You know, somebody said to me yesterday a good thing before I walked on stage made me really happy. Because when people get the essence of my sound, it makes me really happy. He said, “There’s Afrobeats and then there’s Adekunle Gold.” My music doesn’t necessarily fit in what they call Afrobeats that comes out of Nigeria. My sound is unique. It’s highlife, a bit more pop, but still highlife. You know, when I came out I described my sound as “Urban highlife.” But now I think I’m doing Afropop, popular music from Africa. GEORGES: WELL, CALL IT WHAT YOU WILL, THE CROWD AT THE AFROPOP SHOWCASE WAS LOVING IT. 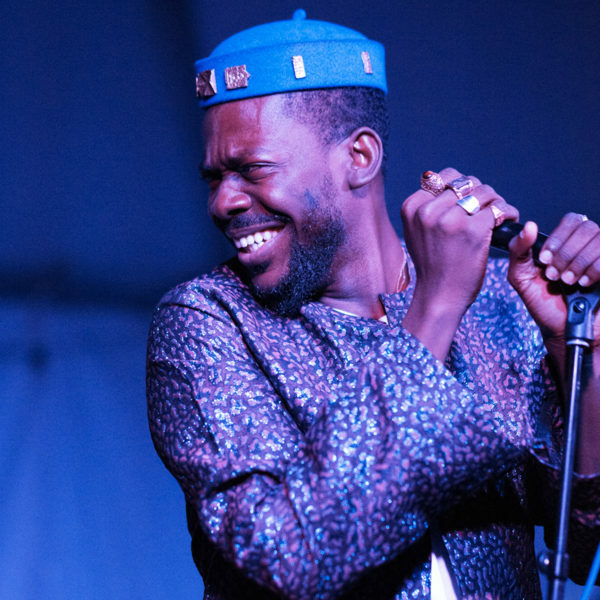 GEORGES: ADEKUNLE GOLD AT THE AFROPOP WORLDWIDE SHOWCASE AT SOUTH BY SOUTHWEST IN AUSTIN, TEXAS. 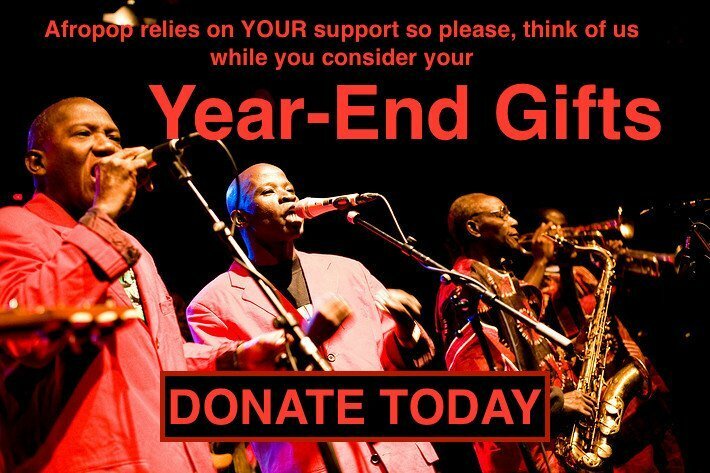 FUNDING FOR AFROPOP WORLDWIDE COMES FROM THE NATIONAL ENDOWMENT FOR THE ARTS, WHICH BELIEVES A GREAT NATION DESERVES GREAT ART, AND PRI PUBLIC RADIO INTERNATIONAL AFFILIATE STATIONS AROUND THE U.S. AND THANK YOU FOR SUPPORTING YOUR PUBLIC RADIO STATION. ACTY: 35_AGold_Ire.wav Ire means “goodness.” So the story around the song is: When I was young, I didn’t know what I was going to become. I knew I could draw, I could paint. I was creative, you know. But knew I wanted to do something much more. So I was always worrying about what my future was going to be like. Little did I know I had everything inside of me already. What I am right now, I was that guy already when I was five. So what I was saying in the song is, “The grass is greener on the other side; that’s what I thought when I took the ride, But if I had known that the life I was searching for was already my own.” This quote changed my life. So that is the one song that I really love to perform the most. It’s the summary of my life in four minutes. GEORGES: ADEKUNLE GOLD WRAPPING UP THE FIRST AFROPOP WORLDWIDE SHOWCASE AT SOUTH BY SOUTHWEST. WHAT A TIME WE HAD! WE’LL BE BACK. COUNT ON IT. THANKS TO TODD PUCKHABER AND THE WHOLE SOUTH BY SOUTHWEST TEAM, ALSO TO OUR ARTISTS, AND THE EXCEPTIONAL FOLKS AT THE PALM DOOR. THANKS ALSO TO GLOBALFEST, OUR CO-PRESENTERS AT THE PALM DOOR’S SECOND STAGE, AND TO BEN RICHMOND FOR HIS HELP WITH CURATION. 101 DON’T FORGE TO VISIT AFROPOP.ORG FOR PHOTOS FROM THE SHOWCASE AND MORE ON ALL THE ARTISTS. YOU CAN ALSO FIND US ON FACEBOOK AND FOLLOW US ON TWITTER AT “AFROPOPWW.” MY AFROPOP PARTNER IS SEAN BARLOW. SEAN PRODUCES OUR PROGRAM FOR WORLD MUSIC PRODUCTIONS. RESEARCH AND PRODUCTION FOR THIS PROGRAM BY BANNING EYRE.